Guy’s Hospital has introduced new technology to bring kidney transplantation out of the ‘ice-age’. For the last 60 years, deceased-donor kidneys have been preserved on ice at 4°C before being transplanted. This has been an effective and inexpensive way of keeping kidneys viable. However, there is an injury associated with keeping organs at low temperatures for too long. We now have a machine that can preserve kidneys without cold storage. 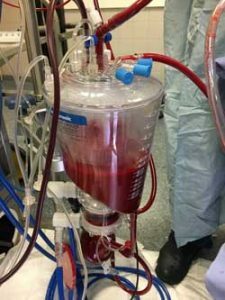 It is called ‘ex vivo normothermic perfusion’ (EVNP), and the machine pumps the kidney with blood and oxygen at body temperature. The advantage is that the kidney remains in a working and living state, even producing urine. This allows surgeons to get a better idea of how the organ will work after transplantation. 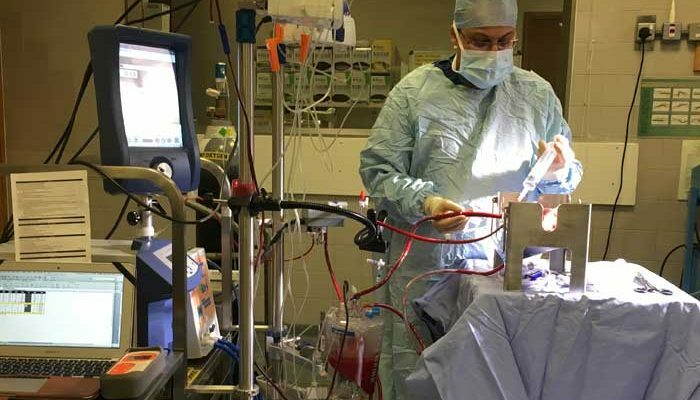 The image at the top of this article shows a kidney undergoing EVNP in the operating theatre, the surgeon keeping a careful eye on the kidney while the machine pumps it with warm oxygenated blood. The kidney itself is not visible, but lies in the metallic box in the centre of the photograph. Oxygen, nutrients and medications are added to the blood before entering the kidney. EVNP may provide the transplant team with more information about whether or not the kidney is suitable for transplantation, and it may also allow the kidney to start working sooner. After transplantation, some kidneys take a few days or weeks to start working, and some patients need a few sessions of dialysis until the kidney is in full swing. EVNP may reduce the risk of ‘sleepy’ kidney, and the medical tests that are needed as a result. The introduction of EVNP at Guy’s Hospital is still in its early stages, which means that only certain types of kidneys and recipients are eligible. If eligible, patients will be approached by one of the members of the EVNP team on Richard Bright ward on the day of their transplant. Thanks to funding kindly provided by GSTTKPA, I am now working on improving the machine further. In particular, I am looking at ways of removing the donor’s white blood cells from within the kidney to see if this further improves its function. Donor white blood cells have been linked with the inflammation that occurs in the kidney after transplantation, and they may even provoke kidney rejection. While I look to remove these harmful cells from the kidney, I am also investigating the ability to deliver back into the kidney regenerative cells that are able to repair damage. This may be ideal for kidneys from deceased donors, which have experienced wear and tear. The overall aim is to enhance the durability and function of kidneys prior to transplantation to provide transplant recipients with the best possible organ. Without the generous funding from the KPA, this exciting research would not be possible. While the results of the research are eagerly awaited, there seems to be a bright future for kidney transplantation.